Why Choose Elastomeric membrane roof ? In Canada, with its temperature extremes, where even summer weather tends to be unpredictable, roofing materials must be chosen with care. You need a roof that is able to endure the harsh Quebec climate and materials that can be installed or repaired under any environmental conditions. Elastomeric membrane roofs meet these two criteria and provide a range of other additional benefits, which makes it a popular choice with architects. Elastomeric membrane roofs have become increasingly popular and now account for nearly half of all the new flat roofs in Quebec. They are reasonably priced and have a 25- to 30-year lifespan. Elastomeric membrane roofing is the ideal choice: it ensures minimum maintenance and provides maximum water tightness. Elastomeric membrane roofs are known for their durability and moisture resistance, and have an attractive finish that provides your roof with a clean, polished look. Our experienced team ensures a quick, top-quality installation. Toitures PME provides comprehensive training to ensure that its workers are up on the latest roofing techniques and able to suggest top quality materials. 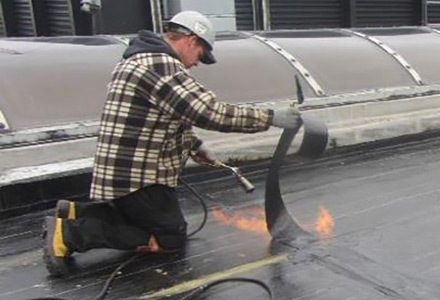 We use proven seaming techniques to connect the membranes, thereby guaranteeing a sturdy, watertight roof. With Toitures PME, you can count on clean, swift, and professional Elastomeric membrane roof installation.